This paper explores what is currently known about the most promising strategies for increasing providers’ capacity to deliver effective behavioral health services and supports. The paper also describes how this information has been—or could be—applied to the design of cutting-edge approaches for building skills and competencies among providers that work with young people who experience serious mental health conditions. Evidence produced in recent years has drawn attention to the idea that the services and supports that are typically available for emerging adults with serious mental health conditions (SMHCs) tend to be neither engaging nor developmentally optimal (Kessler, Demler, & Frank, 2005; Pottick, Bilder, & Vander Stoep, 2008; U. S. Government Accountability Office, 2008). In fact, while young people in this age range experience the highest rates of SMHCs, they are also the population group least likely to engage in behavioral health services, and this is particularly true for young people from racial and ethnic minorities (Substance Abuse and Mental Health Services Administration, 2015, 2017). Recognizing this gap between need and uptake, researchers and service providers have responded by describing and developing promising new approaches specifically designed to meet the unique needs of emerging adults with SMHCs, and a small number of these approaches have been tested to the extent that they can be described as "empirically supported" (i.e., supported by evidence; Walker & Gowen, 2011, 2012; Walker et al., 2013). Many of these approaches share a core of key practice principles that are intended to promote engagement, good working relationships, and the activation of change processes. Typically, the principles encourage practitioners to work with young people in ways that are strengths-based and driven by the young person's perspectives and priorities. Additional shared principles stress the importance of helping the young person to acquire skills for increasing self-determination, as well as skills for building relationships and/or social capital, through connections to supportive adults and peers, and through connections to development-enhancing contexts (Walker 2015; Walker & Flower, 2015). As a complement to efforts to design new approaches specifically for young/emerging adults, the field has also seen initial efforts to adapt and test evidence-based practices (EBPs) that have been shown to be effective for children, adolescents, or adults generally. Discussions of the processes for adapting EBPs so that they are optimal for emerging adults focus on ensuring that the adapted versions are engaging and developmentally appropriate, and compatible with young people's cultures, values, and needs. A key theme in these discussions is that the adaptations should also include attention to enhancing young people's self-determination and relationship-building skills (e.g., Ellison et al., 2015; Institute of Medicine & National Research Council, 2015). The importance of developing and testing structured interventions and programs for young people is reinforced by studies examining what happens when, as is typical in usual care, practitioners use an unstructured, eclectic approach. Studies of service providers working with adults (Carroll & Martino, 2010) or children (Garland et al., 2010; Garland, Bickman, & Chorpita, 2010) have shown that providers using "treatment as usual" very rarely used elements of either evidence-based or best practices, despite frequently believing that they were doing so. In fact, Carroll and Martino found that clinicians in their control condition spent large amounts of time with clients involved in clinician-initiated "chat" that was not connected to treatment and that predicted lower levels of engagement. In contrast, clinicians receiving training in the active condition—Motivational Interviewing, a structured approach—had very low levels of chat. If developmentally-appropriate programs and interventions are to be implemented more widely, there is an obvious need for cost-effective training to create a workforce that is prepared to provide services to emerging adults in effective, engaging, and developmentally-appropriate ways (Clark & Unruh , 2009; Haber, Karpur, Deschênes, & Clark, 2008; Hoffman, Heflinger, Athay, & Davis, 2009; Stein, Connors, Chambers, Thomas, & Stephan, 2014). The broader research on training strategies and components provides guidance on how this can be accomplished. Best practices for training are based on principles of adult learning. Specifically, adults learn best when they are self-directed, internally motivated, and actively engaged in examining their own attitudes and increasing their own knowledge and skills (Trotter, 2006). Ideally, training content builds upon what individual participants already know, is presented in meaningful ways, incorporates active learning processes, and includes a focus on how to apply learning to problems at hand (Kadushin & Harkness, 2002; Trotter, 2006). Effective training that builds on past experiences takes account of stages of professional development (novice to expert), learning processes, individual learning modality preferences (auditory, visual, sensory, practical), and learning styles (Kolb & Kolb, 2005). For service providers to be effective, training initiatives need to prepare them to function in community settings and with the service users that they are likely to encounter in practice (Hoge, Huey, & O'Connell, 2004). Training content and strategies should therefore include a focus on having participants apply their learning to situations and problems they encounter as providers, with support and feedback provided when they implement new practices or techniques (Kadushin & Harkness, 2002; Trotter, 2006). Inclusion of community and service user voices in training initiatives can also help to increase providers' understanding of service contexts and users. For example, communities of color and advocacy organizations such as Youth MOVE National and the Federation of Families for Children's Mental Health have advocated for members of the focal community and service users to be involved in the development and implementation of training initiatives to provide "insider" perspectives. To be well prepared to serve youth, service providers are increasingly asking for young adults with service experiences to provide training, as reported in the recent Pathways Transition Training Partnership/Youth MOVE training needs survey, Supporting You in Supporting Youth (Jivanjee, Brennan, Grover, & Thorpe, 2018). Training providers to work with young people in new ways typically requires substantial time and investment. Less resource-intensive strategies such as training workshops and self-paced online trainings have shown some effectiveness in increasing provider knowledge and changing their attitudes. When workshops are enhanced with opportunities to observe and practice new skills, practitioners are in some cases able to replicate these skills within the controlled context of the training (Lyon, Stirman, Kerns, & Bruns, 2011; Olmstead, Carroll, Canning-Ball, & Martino, 2011). While increased knowledge, favorable attitudes, and the ability to demonstrate key skills in a controlled environment are important precursors to practice change, these kinds of lower-resource strategies are generally acknowledged to be insufficient to create and sustain practice change in real-world settings. (Beidas & Kendall, 2010; Carroll & Rounsaville, 2007; Lyon et al., 2011; Sholomskas et al., 2005). There is a growing consensus that, in order for practitioners to become adept in new ways of working with clients, initial training needs to be followed by high-quality, practice-focused coaching over a period of at least several months (Edmunds, Beidas, & Kendall, 2013; Goense, Boendermaker, & van Yperen, 2016; Martino et al., 2016). Coaching is often understood to be a function of regular supervision, but can also be provided by consultants, expert peers, or other individuals in a dedicated coaching role. High-quality coaching incorporates "gold standard" elements (Dorsey et al., 2013), including observation of practice (either live or via audio- or video recording) and provision of feedback in a manner that is connected to the intervention theory and based on objective criteria (Garland et al., 2013; Herschell, Kolko, Baumann, & Davis, 2010; Milne, Sheikh, Pattison, & Wilkinson, 2011). It is also important that ongoing coaching/supervision incorporate observation, since people generally (Kruger & Dunning, 1999), and clinicians specifically (Martino, Ball, Nich, Frankforter, & Carroll, 2009; Olmstead, Abraham, Martino, & Roman, 2012), tend to be very poor reporters on their own level of skill. The organizational context is also important since organizational structures and systems, management practices, and supervisor, and peer support have been found to impact the extent to which new learning is applied in practice (Beidas & Kendall, 2010; Gray, Sharland, Heinsch, & Schubert, 2015). Team-based learning with others in supportive environments allows opportunities to receive coaching, feedback, and reinforcement (Gururaja, Yang, Paige, & Chauvin, 2008; Lick, 2005; Senge, 1990). In a recent qualitative study of social workers' and social work students' experiences and perspectives on lifelong learning (Jivanjee, Pendell, Nissen, & Goodluck, 2015), participants described examples of workplace cultures that either promoted or inhibited learning and the application of new learning on the job. For example, heavy caseloads, overwork, and fears of making a mistake were described as barriers to ongoing learning, while having a supervisor who supports learning was described as essential. For knowledge transfer to occur, training goals and content must be consistent with organizational goals and be reinforced on the job through management and supervisory support for practice changes, and training efforts must be accompanied by relevant changes in structures for accountability and reporting, as evidenced in a study of staff training to improve practice in child welfare organizations (van Zyl, Antle, & Barbee, 2011). A range of training modalities is used to prepare service providers and to sustain and enhance their skills, each with strengths and limitations. Face-to-face training through workshops and presentations is widely used for continuing education and to support professional licensure (Nissen, Pendell, Jivanjee, & Goodluck, 2014). Face-to-face training has the advantage of being tailored to local conditions, and it tends to be popular with service providers (Jivanjee et al., 2018). Face-to-face training can be helpful for communicating new knowledge and for changing provider attitudes toward new ideas and practices. However, as noted previously there is little evidence that such training leads to knowledge transfer in the absence of follow-up coaching. Further, such trainings are expensive to provide and limited in the numbers of participants. While trainer characteristics and content delivery matter, the most frequently reported best practice strategies for supporting knowledge transfer have been supervisory support and reinforcement, coaching and opportunities to practice, use of interactive activities, post-training evaluation, and correspondence of training content and job responsibilities (Burke & Hutchins, 2008; Lyon et al., 2011; Shapiro & Kazemi, 2017). In recent years, web-based training has grown in popularity as a cost-effective training approach that can reach wide audiences, with additional advantages of being self-paced, convenient, engaging, and transportable across locations (Khanna, Carper, Harris, & Kendall, 2017). Positive outcomes of online training programs for service providers in mental health services have also been reported (e.g., Westbrook, McManus, Clark, & Bennett-Levy, 2012), although participants voiced concerns about inadequate accountability for completion of self-paced online training (McMillen, Hawley, & Proctor, 2016). Other studies suggest that there are further benefits from adding components to online training programs, such as treatment manuals, workshops, consultation, taped review of practice sessions, supervisor training, booster sessions, and/or completion of case reviews (Harned et al., 2014; McCay et al., 2017; Morris & Stuart, 2002; Reeves et al., 2006; Ruzek et al., 2014). Despite the consensus that effective training is necessary to improve the practice of service providers working with young people with mental health difficulties, significant obstacles have been identified that stand in the way of the use of training best practices. In the Supporting You in Supporting Youth survey (Jivanjee et al., 2018), most transition service providers working with young people with mental health challenges endorsed five major barriers to receiving needed training: expense, heavy workload, shortage of travel funds, distance to training, and limited time off. Nearly half of participants also reported that lack of organizational support was at least moderately affecting their training access. About a quarter of respondents also noted that inadequate access to technology for online training and lack of supervisor support had an impact on their ability to get the training they needed. Each of the obstacles endorsed by service providers in the Supporting You in Supporting Youth survey will be discussed. The costs of providing the type of "gold standard" training that will lead to practice change can be a major barrier to the implementation of new programs or interventions. For example, the training that is required as part of EBP implementation is typically consistent with most aspects of the gold standard. Recent studies of implementation of various types of cognitive-behavioral therapy (CBT), one of the most frequently implemented EBPs, provide estimates of these costs. A recent investigation by Lang and Connell (2017) found that, across ten clinics, initial 10-month implementation costs averaged USD $89,575 per agency, $11,659 per participating staff member, and $2,745 per child treated with trauma-focused CBT. Roundfield and Lang (2017) studied ongoing costs to sustain the same intervention across 14 clinics, and found yearly costs of $65,192 per clinic, $4,461 per staff member trained, and $1,896 per child treated. EBP implementation costs are seen as one of the top barriers to implementation (Aarons, Wells, Zagursky, Fettes, & Palinkas, 2009) and were cited as the top reason for discontinuation of an EBP in a study that found that fewer than half of community agencies sustained an EBP over six years (Bond et al., 2014). A likely contributor to the lack of EBP sustainment is that while agencies bear the costs of the training, they typically do not reap the benefits, as payment for services is rarely predicated on client outcomes and other types of benefits (e.g., fewer out-of-home placements or emergency room visits) accrue to other system entities (Roundfield & Lang, 2017). When funding is limited, organizations may have to balance the need for training against the requirement to have staff provide billable services during working hours (Sigel, Benton, Lynch, & Kramer, 2013). The logistics of training may include traveling considerable distances for live face-to-face training opportunities, which involve both travel costs and lost time from work, resulting in reduced revenue (Roundfield & Lang, 2017). Organizations must also insure that supervisory duties are covered, when supervisors attend trainings (Martino et al., 2016). In agencies requiring staff to carry heavy workloads, service providers may have to engage in training opportunities outside of regular working hours, adding to already demanding schedules and workplace stress (Reding et al, in press). Issues arising in organizations that can delay or derail training efforts include resistance to change in the face of limited resources, and the absence of champions in the organization who promote the presentation of new approaches based on evidence, and support their eventual adoption by service providers (Gray & Schubert, 2012). Turnover within organizations, as key staff members take on new roles, or leave altogether and are replaced, can also interfere with the process of planning and executing training programs associated with the adoption of promising, empirically-supported, and evidence-based practices (Beidas et al., 2016). With the development of online training resources for transition service providers, such as self-paced modules and webinar presentations and archives, potential trainees have encountered obstacles to their participation. Their organization may have specific policies that limit access to their preferred technological devices or channels, or the technology-based training programs may not be accessible on the devices that they use most, including mobile phones (Storey, 2017). They may also have difficulty adapting to training delivered through technology, or lack the time and motivation to complete self-paced, or self-directed online training programs (Brennan, Sellmaier, Jivanjee & Grover, 2018; Harned et al., 2014; McMillen et al., 2016). Although some attention has been paid to the importance of reducing supervisor stress and its associated turnover (Tebes et al., 2011), the lack of a consistent and supportive supervisor who fosters the implementation of knowledge and skills derived from training is a key organizational problem (Martino et al., 2016). Supervisors can also experience challenges working with service providers on training issues if they themselves are unfamiliar with the new practice and/or the theory base for the change they are promoting (Regan et al., 2017; Walker & Matarese, 2011). One set of strategies for addressing barriers to the use of training best practices involves creatively combining training modalities and/or incorporating technology to reduce costs and to allow for training experiences that are more in tune with principles of adult learning. For example, providing "live" trainings partially or fully via web conference can eliminate the often substantial costs associated with travel for both trainees and trainers. What is more, when travel costs are eliminated through online delivery of content, training can be spread out over time and skills introduced sequentially, starting with more basic skills and moving to more advanced skills, with time to practice and consolidate gains in between. Similarly, allowing trainees to "observe" real practice by accessing a library of video recordings online can eliminate the costs related to bringing in experts to demonstrate good practice and the costs related to time and travel to observation of real sessions with service users. When trainees can access library material as needed, training can be more self-paced and better matched to individual needs. Another example is the use of audio or video recordings as the basis for consultation on trainees' practice, which can eliminate costs related to having experts shadow trainees in the field. One of the drivers of costs for implementation of new practices is the fact that most providers in community settings see clients that are diverse in terms of needs and, often, age, culture, or other treatment-relevant characteristics. So, for example, per-client costs for an empirically-supported practice are driven up when the treatment—such as a treatment designed for emerging adults or a treatment focused on trauma—is only relevant for a subset of a providers' clients. Strategies involving technology can be helpful in this situation as well, through the use of tele-mental health strategies that allow providers to specialize and provide a single type of service to more homogeneous clients across a wider geographic area (Hilty et al., 2013). Costs are reduced since fewer total providers would need training in order to serve the client population. This strategy would also address the "jack of all trades, master of none" problem, i.e., the need for providers to be trained in multiple interventions or practices in order to meet the needs of diverse clients. Even if agencies have the funding to comprehensively support multiple practices, it is not clear that providers can fully master a sufficient number of relevant practices such that at least one of those will be relevant to meeting the needs of any given client. Specialization for the role of trainer and practice consultant/coach can also be facilitated technologically to improve cost-effectiveness. For example, significant expense is often incurred training local supervisors and practice coaches to support a new intervention or program. Typically, these staff will not have knowledge or experience using the new practice themselves (and often they do not carry a caseload anyway), so training them to a sufficient level of expertise requires substantial investment of both time and funds. And of course, this investment is lost if the supervisor/coach leaves the job. Many training efforts rely on train-the-trainer models to develop local expertise, but available research indicates that trainer competence drops off with each step of remove from the purveyor (Olmstead et al., 2011). Additionally, on-site coaches and supervisors typically experience competition for their time, which makes it difficult for them to provide ongoing training support that matches best practice. However, if it is not necessary to be on site (i.e., training takes place using tele- and web-based strategies) training and coaching can be provided indefinitely by specialists with expert knowledge, resulting in higher quality at reduced cost. A third set of strategies capitalizes on the fact that evidence-based and empirically-supported interventions often share core elements, components or modules with one another (e.g., Weisz et al., 2012; Walker, 2015). One specific strategy proposes that providers can be trained in the elements that appear frequently as constituents of larger evidence-based and empirically-supported interventions. Once trained, the providers can then apply these elements flexibly to meet individual client needs. This approach has been explored for component elements of psychotherapy for children (e.g., behavioral contracting, goal setting, guided imagery; Chorpita & Daleiden, 2009) and holds promise for reducing the costs of training providers to work effectively with children. A slightly different strategy involves creating and testing structured enhancements—e.g., engagement or communication enhancements—that can be used to improve practice elements that are shared across interventions (e.g., Walker, Seibel, & Jackson, 2017). As noted previously, in collaboration with Youth MOVE National, Pathways Research and Training Center has undertaken the Supporting You in Supporting Youth survey as a means of better understanding providers' perceptions of training needs and their preferences regarding training modalities (Jivanjee et al., 2017). This information can help move the field forward in responding to the needs, opportunities and challenges described here. Additionally, Pathways RTC is developing and testing several competency-building approaches that incorporate a variety of cutting edge strategies, described in this document. Further details about each of these training projects can be found in the linked documents. Achieve My Plan (AMP; Walker et al., 2017), is an enhancement for existing interventions and programs that build providers' competence in working with young people in ways that promote their acquisition of self-determination skills, ensure that care/treatment is based on their perspectives and priorities, and promote strengths in meaningful ways. Current AMP training is completely delivered via "remote" training and coaching (i.e., via webconference and the internet) in a way that conforms to best practices outlined here. AMP+ is an adaptation of "original AMP," and is also an enhancement to existing interventions or programs (Walker, Baird, & Welch, 2018). AMP+ aims to build skills for young adult peer support providers who work in a peer role that is focused on supporting young people to carry out activities and plans in the community. AMP+ training is also delivered remotely in a manner that is similar to the training for "original" AMP. Technology-Enhanced Coaching focuses on helping supervisors to perform more effectively in the role of coaching their providers in skills for working more effectively using TIP (the Transition to Independence Program, a widely implemented intervention for working with older youth and young adults who experience serious mental health conditions). Supervisors are coached by Pathways staff in the efficient use of a reliable feedback system that incorporates video of providers' work. Promoting Positive Pathways to Adulthood (PPPA; Brennan, Jivanjee, Sellmaier, & Grover, 2018) is a 10-module online training program with an accompanying toolkit of practice activities based on core competencies identified through literature searches and stakeholder consultation. A recent study tested the outcomes of PPPA and found that participants receiving either online training only or online training plus team-based practice exercises made significant gains in transition-related knowledge and self-rated transition competencies, with those participating in team-based exercises achieving greater knowledge gains. This review of research and conceptual literature and lessons learned from Pathways training initiatives provides support for training and workforce development strategies that build on principles of adult learning, take advantage of new technologies, and reinforce the application of new learning through on-the-job consultation and coaching. To improve outcomes for youth and young adults with mental health needs, service providers must be well-prepared and supported to offer services that are engaging, evidence-based, developmentally appropriate, and compatible with young people's cultures, values and needs. The research examined here reveals that creative uses of a variety of training methods are needed, with ongoing studies to identify the most effective combinations of training and coaching strategies for service providers at different stages of professional development and with different learning styles. Further research is needed to understand and disseminate the most effective methods for preparing service providers to offer developmentally appropriate and evidence-based supports to enhance young people's self-determination and relationship-building skills in order to achieve their self-identified goals. Aarons, G.A., Wells, R.S., Zagursky, K., Fettes, D.L., & Palinkas, L.A. (2009). Implementing evidence-based practice in community mental health agencies: A multiple stakeholder analysis. American Journal of Public Health, 99(11), 2087–2095. Beidas, R.S., & Kendall, P.C. (2010). Training therapists in evidence-based practice: A critical review of studies from a systems-contextual perspective. Clinical Psychology: Science and Practice, 17(1), 1-30. Beidas, R.S., Marcus, S., Wolk, C.B., Powell, B., Aarons, G.A., Evans, A.C., ... Mandell, D.S. (2016). A prospective examination of clinician and supervisor turnover within the context of implementation of evidence-based practices in a publicly-funded mental health system. Administration and Policy in Mental Health and Mental Health Services Research, 43, 640-649. Bond, G.R., Drake, R.E., McHugo, G.J., Peterson, A.E., Jones, A.M., & Williams, J. (2014). Long-term sustainability of evidence-based practices in community mental health agencies. Administration and Policy in Mental Health and Mental Health Services Research, 41(2), 228–236. Brennan, E.M., Jivanjee, P., Sellmaier, C., & Grover, L. (2018). Promoting Positive Pathways to Adulthood: Outcomes of an online training program for transition service providers. Portland, OR: Pathways Transition Training Partnership, Research and Training Center on Pathways to Positive Futures, Portland State University. Brennan, E.M., Sellmaier, C., Jivanjee, P., & Grover, L. (2018). Is online training an effective workforce development strategy for transition service providers? A comparative study. Manuscript submitted for publication. Burke, L.A., & Hutchins, H.M. (2008). A study of best practices in training transfer and proposed model of transfer. Human Resource Development Quarterly, 19(2), 107-128. Carroll, K.M., & Martino, S. (2010). No train, no gain? Clinical Psychology: Science and Practice, 17, 36–40. Carroll, K.M., & Rounsaville, B.J. (2007). A vision of the next generation of behavioral therapies research in the addictions. Addiction, 102, 850-862. Chorpita, B.F., & Daleiden, E.L. (2009). Mapping evidence-based treatments for children and adolescents: Application of the distillation and matching model to 615 treatments from 322 randomized trials. Journal of Consulting and Clinical Psychology, 77(3), 566-579. Clark, H.B., & Unruh, D.K. (2009). Understanding and addressing the needs of transition-age youth and young adults and their families. In H. B. Clark, & D. K. Unruh (Eds. ), Transition of youth and young adults with emotional or behavioral difficulties: An evidence-supported handbook (pp. 3-24). Baltimore, MD: Brookes Publishing. Dorsey S., Pullmann, M.D., Deblinger, E., Berliner, L., Kerns, S.E., Thompson, K., ... Garland, A.F. (2013). Improving practice in community-based settings: A randomized trial of supervision-study protocol. Implementation Science, 8(89), 1–11. Edmunds, J.M., Beidas, R.S., & Kendall, P.C. (2013). Dissemination and implementation of evidence-based practices: Training and consultation as implementation strategies. Clinical Psychology-Science and Practice, 20(2), 152–165. Ellison, M.L., Klodnick, V.V., Bond, G.R., Krzos, I.M., Kaiser, S.M., Fagan, M.A., & Davis, M. (2015). Adapting supported employment for emerging adults with serious mental health conditions. The Journal of Behavioral Health Services & Research, 42(2), 206–222. Garland, A.F., Bickman, L., & Chorpita, B.F. (2010). Change what? Identifying quality improvement targets by investigating usual mental health care. Administration and Policy in Mental Health, 37(1–2), 15–26. Garland, A.F., Brookman-Frazee, L., Hurlburt, M.S., Accurso, E.C., Zoffness, R.J., Haine-Schlagel, R., & Ganger, W. (2010). Mental health care for children with disruptive behavior problems: A view inside therapists' offices. Psychiatric Services, 61(8), 788–795. Garland, A.F., Haine-Schlagel, R., Brookman-Frazee, L., Baker-Ericzen, M., Trask, E., & Fawley-King, K. (2013). Improving community-based mental health care for children: Translating knowledge into action. Administration and Policy in Mental Health, 40(1), 6–22. Goense, P.B., Boendermaker, L., & van Yperen, T. (2016). Support systems for treatment integrity. Research on Social Work Practice, 26(1), 69–73. Gray, M., & Schubert, L. (2012). Sustainable social work: Modelling knowledge production, transfer, and evidence-based practice. International Journal of Social Welfare, 21, 203-214. Gray, M., Sharland, E., Heinsch, M., & Schubert, L. (2015). Connecting research to action: Perspectives on research utilization. British Journal of Social Work, 45, 1952-1967. Haber, M.G., Karpur, A., Deschênes, N., & Clark, H.B. (2008). Predicting improvement of transitioning young people in the partnerships for youth transition initiative: Findings from a multisite demonstration. The Journal of Behavioral Health Services & Research, 35(4), 488–513. Harned, M.S., Dimeff, L.A., Woodcock, E.A., Kelly, T., Zavertnik, J., Contreras, I., & Danner, S.M. (2014). Exposing clinicians to exposure: A randomized controlled dissemination trial of exposure therapy for anxiety disorders. Behavior Therapy, 45, 731-744. Herschell, A.D., Kolko, D.J., Baumann, B.L., & Davis, A.C. (2010). The role of therapist training in the implementation of psychosocial treatments: A review and critique with recommendations. Clinical Psychology Review, 30(4), 448–66. Hilty, D.M., Ferrer, D.C., Parish, M.B., Johnston, B., Callahan, E.J., & Yellowlees, P.M. (2013). The effectiveness of telemental health: A 2013 review. Telemedicine Journal and e-Health, 19(6), 444-454. Hoffman, C., Heflinger, C.A., Athay, M., & Davis, M. (2009). Policy, funding, and sustainability: Issues and recommendations for promoting effective transition systems. In H.B. Clark & D.K. Unruh, (Eds. ), Transition of youth and young adults with emotional or behavioral difficulties: An evidence-based handbook (pp. 263-290). Baltimore, MD: Paul H. Brookes. Hoge, M.A., Huey, L.Y., & O'Connell, M.J. (2004). Best practices in behavioral health workforce education and training. Administration and Policy in Mental Health, 32(2), 92-106. Institute of Medicine and National Research Council. (2015). Investing in the health and well-being of young adults. Washington, DC: The National Academies Press. Jivanjee, P., Brennan, E.M., Grover, L., & Thorp, K. (2018). What do transition service providers need to know and be able to do? Results of a national survey of training needs and preferences. Portland, OR: Pathways Transition Training Partnership, Research and Training Center on Pathways to Positive Futures, Portland State University. Jivanjee, P., Pendell, K., Nissen, L.B., & Goodluck, C. (2015). Lifelong learning in social work: A qualitative exploration with social work practitioners and students. Advances in Social Work, 16(2) 260-275. Kadushin, A., & Harkness, D. (2002). Supervision in social work (4th ed.). New York, NY: Columbia University Press. Kessler, R., Demler, O., & Frank, R. (2005). Prevalence and treatment of mental disorders 1990 to 2003. New England Journal of Medicine, 352(24), 2515–2523. Khanna, M.S., Carper, M.M., Harris, M.S., & Kendall, P.C. (2017). Web-based parent-training for parents of youth with impairment for anxiety. Evidence-Based Practice in Child and Adolescent Mental Health, 2(1), 43-53. Kolb, A.Y., & Kolb, D.A. (2005). Learning styles and learning spaces: Enhancing experiential education in higher education. Academy of Management Learning & Education, 4(2), 193-212. Kruger, J., & Dunning, D. (1999). Unskilled and unaware of it: How difficulties in recognizing one's own incompetence lead to inflated self-assessments. Journal of Personality and Social Psychology, 77(6), 1121–1134. Lang, J.M., & Connell, C.M. (2017). Measuring costs to community-based agencies for implementation of an evidence-based practice. Journal of Behavioral Health Services & Research, 44, 122–134. Lick, D.W. (2005). A new perspective on organizational learning: Creating learning teams. Evaluation and Program Planning, 29, 88-96. Lyon, A.R., Stirman, S.W., Kerns, S.E.U., & Bruns, E.J. (2011). Developing the mental health workforce: A review and application of training approaches from multiple disciplines. Administration and Policy in Mental Health, 38, 238-253. Martino, S., Ball, S., Nich, C., Frankforter, T.L., & Carroll, K. M. (2009). Correspondence of motivational enhancement treatment integrity ratings among therapists, supervisors, and observers. Psychotherapy Research: Journal of the Society for Psychotherapy Research, 19(2), 181–193. Martino, S., Parish, M., Añez, L., Nich, C., Canning-Ball, M., Hunkele, K., ... Carroll, K.M. (2016). The effectiveness and cost of clinical supervision for Motivational Interviewing: A randomized controlled trial. Journal of Substance Abuse Treatment, 68, 11-23. McCay, E., Carter, C., Aiello, A., Quesnel, S., Howes, C., Beanlands, H., ... Lord, C. (2017). Training frontline community agency staff in dialectical behavior therapy: Building capacity to meet the mental health needs of street-involved youth. The Journal of Mental Health Training, Education, and Practice, 12(2), 121-132. McMillen, J.C., Hawley, K.M., & Proctor, E.K. (2016). Mental health clinicians' participation in web-based training for an evidence supported intervention: Signs of encouragement and trouble ahead. Administration and Policy in Mental Health and Mental Health Services Research, 43, 592-603. Milne, D., Sheikh, A., Pattison, S., & Wilkinson, A. (2011). Evidence-based training for clinical supervisors: A systematic review of 11 controlled studies. The Clinical Supervisor, 30(1), 53–71. Morris, J.A., & Stuart, G.W. (2002). Training and education needs of consumers, families, and front-line staff in behavioral health practice. Administration and Policy in Mental Health, 29(4/5), 377-402. Nissen, L., Pendell, K., Jivanjee, P., & Goodluck, C. (2014). Lifelong learning in social work education: A review of the literature and implications for the future. Journal of Teaching in Social Work, 34(4), 384-400. Olmstead, T.A., Abraham, A.J., Martino, S., & Roman, P.M. (2012). Counselor training in several evidence-based psychosocial addiction treatments in private US substance abuse treatment centers. Drug and Alcohol Dependence, 120(1–3), 149–154. Olmstead, T., Carroll, K.M., Canning-Ball, M., & Martino, S. (2011). Cost and cost-effectiveness of three strategies for training clinicians in motivational interviewing. Drug and Alcohol Dependence, 116(1–3), 195–202. Pottick, R., Bilder, S., & Vander Stoep, A. (2008). US patterns of mental health service utilization for transition-age youth and young adults. Journal of Behavioral Health Services & Research, 35(4), 373–389. Reding, M.E.J., Guan, K., Regan, J., Palinkas, L.A., Lau, A.S., & Chorpita, B.F. (in press). Implementation in a changing landscape: Provider experiences during rapid scaling of use of evidence-based treatments. Cognitive and Behavioral Practice. Reeves, S., Freeth, D., Glen, S., Leiba, T., Berridge, E-J., & Herzberg, J. (2006). Delivering practice-based interprofessional education to community mental health teams: Understanding some key lessons. Nurse Education in Practice, 6, 246-253. Regan, J., Lau, A.S., Barnett, M., Stadnick, N., Hamilton, A., Pesanti, K., ... Brookman-Frazee, L. (2017). Agency responses to a system-driven implementation of multiple evidence-based practices in children's mental health services. BMC Health Services Research, 17, 671-684. Roundfield, K.D., & Lang, J.M. (2017). Costs to community mental health agencies to sustain an evidence-based practice. Psychiatric Services, 68(9), 876-882. Ruzek, J.I., Rosen, R.C., Garvert, D.W., Smith, L.D., Sears, K.C., Marceau, L., ... Stoddard, A.M. (2014). Online self-administered training of PTSD treatment providers in cognitive-behavioral intervention skills: Results of a randomized controlled trial. Journal of Traumatic Stress, 27, 703-711. Senge, P.M. (1990). The fifth discipline: The art & practice of the learning organization. New York, NY: Doubleday Business. Shapiro, M., & Kazemi, E. (2017). A review of training strategies to teach individuals implementation of behavioral interventions. Journal of Organizational Behavior Management, 37(1), 32-62. Sholomskas, D.E., Syracuse-Siewert, G., Rounsaville, B.J., Ball, S.A., Nuro, K.F., & Carroll, K.M. (2005). We don't train in vain: A dissemination trial of three strategies of training clinicians in cognitive-behavioral therapy. Journal of Consulting and Clinical Psychology, 73(1), 106-115. Sigel, B.A., Benton, A.H., Lynch, C.E., & Kramer, T.L. (2013). Characteristics of 17 statewide initiatives to disseminate Trauma-focused Cognitive-Behavioral Therapy (TF-CBT). Psychological Trauma: Theory, Research, Practice, and Policy, 5(4), 323-333. Stein, K.F., Connors, E.H., Chambers, K.L., Thomas, C.L., & Stephan, S.H. (2014). Youth, caregiver, and staff perspectives on an initiative to promote success of emerging adults with emotional and behavioral disabilities. The Journal of Behavioral Health Services & Research, 43(4), 582-596. Storey, G.S. (2017). An empirical analysis for Bring-Your-Own-Device (BYOD) policy adoption in organizations (Doctoral dissertation). Retrieved from ProQuest Dissertations Publishing (No. 10265019). Substance Abuse and Mental Health Services Administration. (2015). Racial/ ethnic differences in mental health service use among adults. HHS Publication No. SMA-15-4906. Rockville, MD: Substance Abuse and Mental Health Services Administration. Tebes, J.K., Matlin, S.L., Migdole, S.J., Farkas, M.S., Money, R.W., Shulman, L., & Hoge, M.A. (2011). Providing competency training to clinical supervisors through an interactional supervision approach. Research on Social Work Practice, 21(2), 190-199. Trotter, Y.D. (2006). Adult learning theories: Impacting professional development programs. The Delta Kappa Gamma Bulletin, Spring, 8-13. U.S. Government Accountability Office. (2008). Young adults with serious mental illness: Some states and federal agencies are taking steps to address their transition challenges. Publication No. 08-678. Washington DC: U.S. Government Accountability Office. van Zyl, M.A., Antle, B.F., & Barbee, A.P. (2011). Using training to change the learning environment in public child welfare organizations. In M. Roberts-DeGennaro & S. J. Fogel (Eds. ), Using evidence to inform practice for community and organizational change (pp. 177-199). Chicago, IL: Lyceum. Walker, J.S. (2015). A theory of change for positive developmental approaches to improving outcomes among emerging adults with serious mental health conditions. Journal of Behavioral Health Services & Research, 42(2), 131–149. Walker, J.S., & Flower, K.M. (2015). Provider perspectives on principle-adherent practice in empirically-supported interventions for emerging adults with serious mental health conditions. Journal of Behavioral Health Services & Research, 43(4),525-540. Walker, J.S., & Gowen, L.K. (2012). Transition education for adolescents with serious mental health concerns. In M. L. Wehmeyer & K. W. Webb (Eds. ), Handbook of transition education for youth with disabilities (pp. 475-493). New York, NY: Routledge. Walker, J., & Matarese, M. (2011). Using a theory of change to drive human resource development for wraparound. Journal of Child and Family Studies, 20, 791-803. Walker, J.S., Seibel, C.L., & Jackson, S. (2017). Increasing youths' participation in team-based treatment planning: The Achieve My Plan enhancement for wraparound. Journal of Child and Family Studies, 26(8), 1–11. Weisz, J.R., Chorpita, B., Palinkas, L.A., Schoenwald, S. K., Miranda, J., Bearman, S.K., ... Research Network on Youth Mental Health. (2012). Testing standard and modular designs for psychotherapy treating depression, anxiety, and conduct problems in youth. Archives of General Psychiatry, 69(3), 274-282. Westbrook, D., McManus, F., Clark, G., & Bennett-Levy, J. (2012). Preliminary evaluation of an online training package in Cognitive Behaviour Therapy: Satisfaction ratings and impact on knowledge and confidence. Behavioural and Cognitive Psychotherapy, 40(4), 481-490. Walker, J., Jivanjee, P., Brennan, E.M., & Grover, L. (2018). 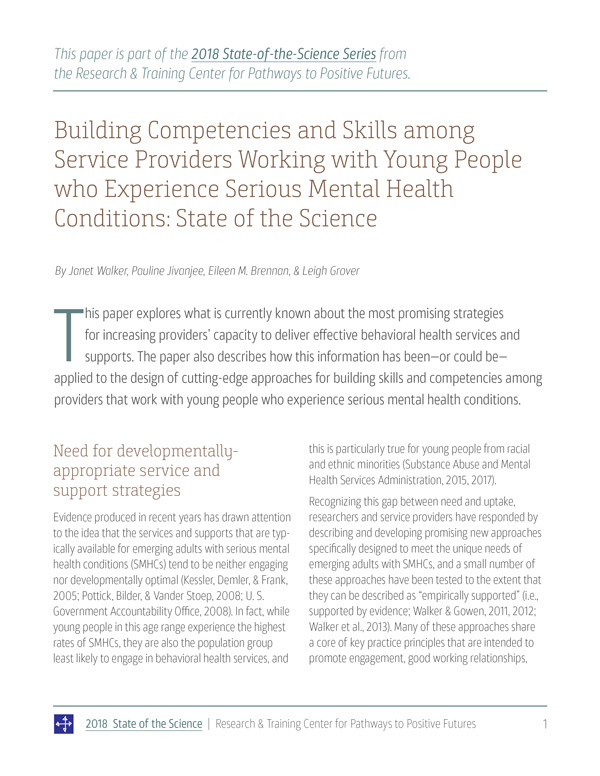 Building Competencies and Skills among Service Providers Working with Young People who Experience Serious Mental Health Conditions: State of the Science. Portland, OR: Research and Training Center for Pathways to Positive Futures, Portland State University.